Detects protein interacting with Protein Kinase C (PICK 1). By Western blot, this antibody detects an ~52 kDa protein representing PICK 1 from AtT20 cell extract. Immunocytochemical staining of CV1 cells transfected with PICK 1 results in a diffuse staining pattern when expressed alone and coclustered when coexpressed with mGluR7. Synthetic peptide corresponding to Mouse PICK1 aa 1-18. Our Abpromise guarantee covers the use of ab3420 in the following tested applications. ICC Use a concentration of 1.7 µg/ml. WB Use a concentration of 2 µg/ml. Detects a band of approximately 52 kDa.Can be blocked with PICK1 peptide (ab4964). Probable adapter protein that bind to and organize the subcellular localization of a variety of membrane proteins containing some PDZ recognition sequence. Involved in the clustering of various receptors, possibly by acting at the receptor internalization level. Plays a role in synaptic plasticity by regulating the trafficking and internalization of AMPA receptors. May be regulated upon PRKCA activation. May regulate heteromeric ACCN3/ACCN2 channel. Phosphorylation at Thr-82 appears to inhibit the interaction with AMPA receptors. Cytoplasm > perinuclear region. Cell junction > synapse. Also present at excitatory synapses. 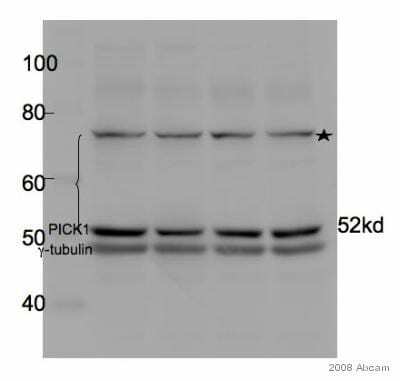 Western blot - Anti-PICK1 antibody (ab3420)This image is courtesy of an anonymous abreview. Additional bands at: ~40 kDa. We are unsure as to the identity of these extra bands. 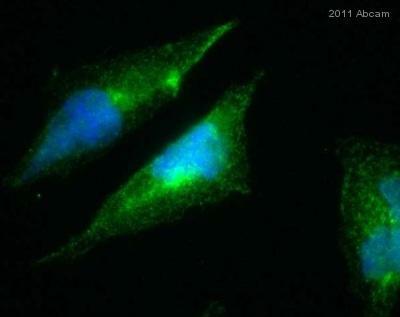 Immunocytochemistry/ Immunofluorescence - Anti-PICK1 antibody (ab3420)This image is courtesy of an anonymous abreview. 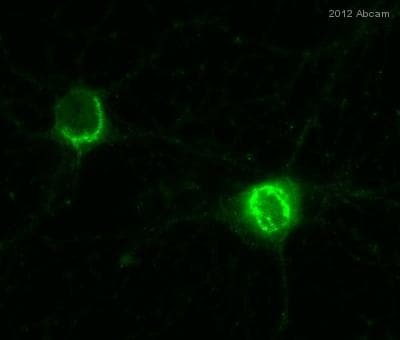 ab3420 staining PICK1 in mouse Hippocampal neurons by Immunocytochemistry/ Immunofluorescence. Cells were fixed in paraformaldehyde and permeabilized in 0.1% saponin/PBS prior to blocking in 3% BSA for 1 hour at room temperature. The primary antibody was diluted 1/300 in 3% BSA, 0.1% saponin /PBS and incubated with the sample for 18 hours at 4 °C. The secondary antibody was Alexa Fluor® 455-conjugated Donkey anti-Rabbit polyclonal, diluted 1/1000. IHC image of ab3420 staining in rat adult brain formalin fixed paraffin embedded tissue section, performed on a Leica BondTM system using the standard protocol F. The section was pre-treated using heat mediated antigen retrieval with sodium citrate buffer (pH6, epitope retrieval solution 1) for 20 mins. The section was then incubated with ab3420, 1µg/ml, for 15 mins at room temperature and detected using an HRP conjugated compact polymer system. DAB was used as the chromogen. The section was then counterstained with haematoxylin and mounted with DPX. ab3420 staining PICK1 in CHO cells stably transfected with Human PICK1 by Immunocytochemistry/ Immunofluorescence. Cells were fixed in paraformaldehyde and permeabilized in 0.5% Triton X-100 prior to blocking in 10% serum for 1 hour at room temperature. The primary antibody was diluted 1/1000 in PBS, 0.5% Triton, 10% FCS and incubated with the sample for 2 hours at °C. The secondary antibody was Alexa Fluor® 488-conjugated Goat anti-Rabbit polyclonal, diluted 1/500. Western blot of PICK1 on AtT20 cell lysate using ab3420.